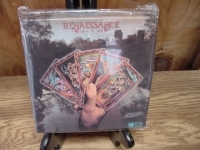 "Renaissance, Turn Of The Cards - OBI Box Set of 3 Minis"
RENAISSANCE - TURN OF THE CARDS - Japanese OBI MINI REPLICA LP TITLES making a 3 CD Box Set- *also sold separately Japanese OBI MINI REPLICA BOX SET Japanese re-mastered Mini LP replica Limited Edition Collection Recorded from the finest Original Masters available. Each title Comes with anti-static sleeves similar to Vinyl LPs, Cardboard packaging exact to the original LP, Re-sealable plastic wrap cases for protection of each collectible and includes extensive Liner Notes Booklet. Actual miniaturized version of the 12" LP in 4" CD version Special VERY RARE LIMITED EDITION BOX SET ONLY PRODUCED ON FUTURES FOR THIS ONE TIME PRESSING -- were only available in Japan. THE BOX SET - INCLUDES LIVE AT CARNEGIE HALL - 2 DISC SET WITH GATEFOLD COVER - Track Listings 1. Prologue 2. Ocean Gypsy 3. Can You Understand 4. Carpet Of The Sun 5. Running Hard 6. Mother Russia 7. Scheherazade 8. Ashes Are Burning SCHEHERAZADE - Track Listings 1. Trip to the Fair 2. Vultures Fly High 3. Ocean Gypsy 4. Song of Scheherazade: Fanfare/The Betrayal/The Sultan/Love ... TURN OF THE CARDS - Track Listings 1. Running Hard 2. I Think of You 3. Things I Don't Understand 4. Black Flame 5. Cold Is Being 6. Mother Russia These are Japanese digitally re-mastered Mini LP replica CDs (the OBI Edition). This Limited Edition Collection has only VERY FEW made world-wide and are immediately Out of Print. Recorded from the finest Original Masters available. Comes with anti-static sleeves similar to Vinyl LPs, Cardboard packaging like an LP, includes extensive Liner Notes Booklet. Actual miniaturized version of the 12inch LP in 4inch CD version.